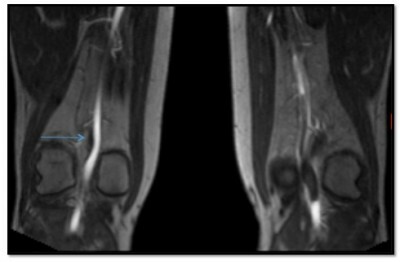 Abstract: Popliteal artery entrapment syndrome (PAES) is an uncommon condition resulting from an abnormal anatomic relationship between the popliteal artery and the surrounding musculature. The compression created by this variance in anatomy can lead to ischemia and vascular claudication. The diagnosis of PAES requires a thorough patient history and physical exam, a high index of suspicion, and dedicated imaging techniques. Several treatment options are available, including surgical intervention, thrombolysis, or a combination of these depending on the clinical indication. We present a case of PAES in a 34-year-old man who presented with typical symptoms illustrative of the complicated decision making related to this disorder.